I CHALLENGE YOU to look at this issue and not say ‘I never knew there was so much in it!’ Here we are in our new monthly format, bursting with new features and regulars. We’ve got more news, an in-depth look at a crucial issue in ‘news focus’ (page 7), and a chance to get to know the story behind some key figures in the ‘profile’, starting with the much-respected figure of Noreen Oliver (page 20). We’ve brought in a soapbox to invite challenging views from all quarters (step up Prof McKeganey, page 19) and want you to let us know what you think (letters, page 10). 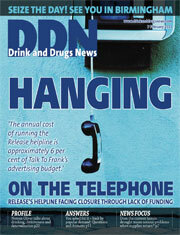 We hope DDN will continue to inform you, but we also hope it will inspire, entertain and involve you. I make no apology for trumpeting Q&A’s return (page 11), as it’s one of the most popular suggestions we took on board from our DDN survey responses at the end of last year. There are plenty more new features and columns in the pipeline, so please give us your feedback. We’re all looking forward to our DDN/Alliance conference next Thursday (10 February) –hope to meet you there! See you at the beginning of March, when we’ll be sharing the highlights.